Read through some of the reviews by previous Aussie Resort guests. Since 2002 our family has enjoyed over 20 holidays at Aussie Resort and we all love it. The pool is amazing, as well as having a spa. 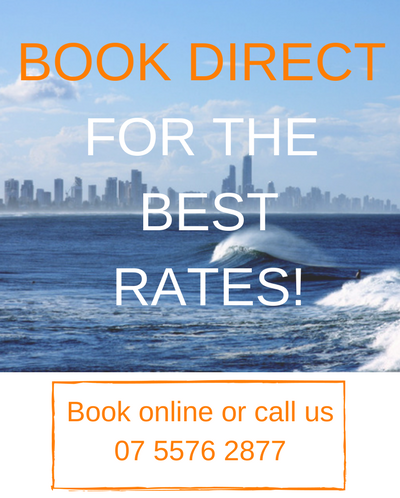 The location is perfect only minutes from Burleigh Heads, and rooms great value. Simply great for families without hurting the wallet. Aussie Resort was definitely up there with my favourite places to stay. It is in an absolutely fabulous location – so close to beach, shops, restaurants and surf clubs. Park your car and walk everywhere. Our apartment was terrific, clean, great beds, great kitchen and bathroom with everything you need. My favourite thing was the “Aussie” shaped pool and spa. We loved our stay with Aussie Resort at Burleigh and have recommended it to lots of friends. The Managers are friendly and obliging, the room we had was great, the pool was magnificent, the parking was good and the location suited us perfectly. Work and circumstances are spoiling for both of us this year but we would have been back to you in a heartbeat if those circumstances were different. This resort must be one of the best kept secrets. Amazing value for a fully self contained unit just a few steps to the beach. Very helpful staff who booked our tours and we were picked up from the entrance. Aussie Resort has a friendly, happy atmosphere and we’ve booked our next holiday.